Heat oven to 375°F. Spray 8-inch square (2-quart) glass baking dish with cooking spray. Cook and drain pasta as directed on package. Rinse with cool water; drain. In medium bowl, mix beef, 1/4 cup of the bread crumbs, the onion, salt, pepper, allspice, nutmeg, milk and egg yolk. Shape into 8 (2-inch) meatballs. In 10-inch nonstick skillet, melt 2 tablespoons of the butter over medium-high heat. Add meatballs; cook 4 to 6 minutes, turning occasionally, until browned on all sides. Use slotted spoon to transfer meatballs to plate. Reduce heat to medium; add flour to skillet. Cook and stir 1 minute. Add broth and whipping cream; stir until smooth. Heat to boiling; boil 1 minute. Remove from heat. Insert meatball into each pasta shell; arrange in baking dish. 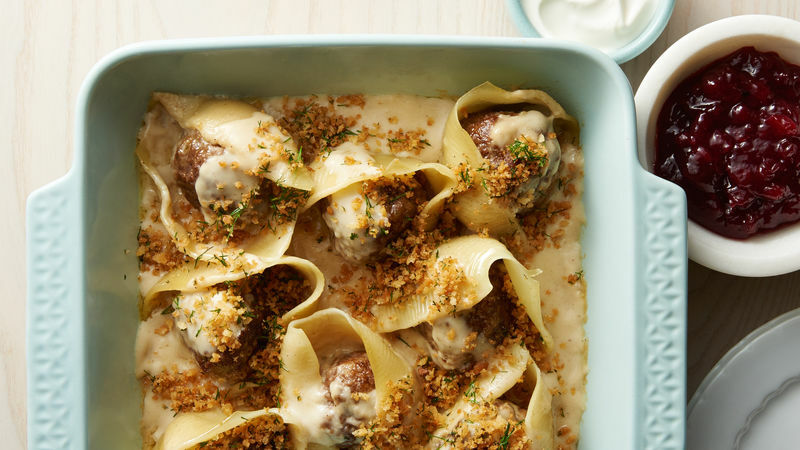 Pour sauce over meatball-stuffed pasta shells. Cover; bake 30 to 35 minutes or until meatballs are thoroughly cooked and no longer pink in center (at least 165°F). Remove from oven; spoon some of the sauce from bottom of baking dish over stuffed shells. Meanwhile, in 8-inch skillet, heat remaining 1 tablespoon butter over medium heat. Add remaining 1/4 cup bread crumbs; cook 3 to 4 minutes, stirring frequently, until golden brown. Transfer to shallow bowl; add dill weed. Sprinkle over baked stuffed shells; serve with sour cream and lingonberry preserves on the side. Lingonberry preserves are a sweet-tart condiment often used in both savory and sweet Scandinavian dishes. It can be found in the jelly-jam section of the grocery store. Cranberry sauce can be substituted for the lingonberry preserves, if desired. Adding fresh dill to the warm toasted bread crumbs gives the dish an added Scandinavian touch.